بخشعلی زاده, شیما, بانی, علی. (1396). رشد و قطر خار باله سینه ای بچه تاس ماهی ایرانی (Acipenser persicus) پرورشی جنوب دریای خزر. فصلنامه محیط زیست جانوری, 9(4), 231-234. شیما بخشعلی زاده; علی بانی. "رشد و قطر خار باله سینه ای بچه تاس ماهی ایرانی (Acipenser persicus) پرورشی جنوب دریای خزر". 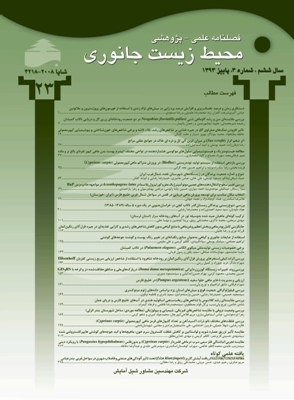 فصلنامه محیط زیست جانوری, 9, 4, 1396, 231-234. بخشعلی زاده, شیما, بانی, علی. (1396). 'رشد و قطر خار باله سینه ای بچه تاس ماهی ایرانی (Acipenser persicus) پرورشی جنوب دریای خزر', فصلنامه محیط زیست جانوری, 9(4), pp. 231-234. بخشعلی زاده, شیما, بانی, علی. رشد و قطر خار باله سینه ای بچه تاس ماهی ایرانی (Acipenser persicus) پرورشی جنوب دریای خزر. فصلنامه محیط زیست جانوری, 1396; 9(4): 231-234. رشد و قطر خار باله سینه ­ای بچه تاس­ ماهی ایرانی (Acipenser persicus) پرورشیسایت­های جنوب ­شرقی و غربی دریای خزر پیش از رهاسازی به دریا بررسی گردید. پس از زیست­ سنجی بچه ماهیان، خار باله سینه ­ای سمت راست آن­ ها جدا گردید، وزن شد و اندازه آن­ ها ثبت گردید. هیچ تفاوت معنی ­داری در وزن و طول بچه ماهیان جنوب ­شرقی و غربی دریای خزر مشاهده نشد. شاخص چاقی هم تفاوت معنی­ داری بین دو منطقه نداشت (0/05<P). رابطه بین وزن بدن و وزن خار باله سینه ­ای در هر دو منطقه معنی­ دار بود. تفاوت معنی­ داری بین قطر مقطع خارهای باله سینه ­ای در دو ناحیه شرق و غرب وجود نداشت. منحنی رابطه میان طول با وزن بچه ماهیان به ­صورت ازلی بود، به گونه ­ای­ که بخش عمده رشد در روزهای ابتدایی زندگی مشاهده شد. این مطالعه نشان داد ویژگی ­های مشابه در رشد بچه تاس ­ماهیان ایرانی پرورشی نواحی جنوب­ شرقی و غربی دریای خزر وجود دارد که می ­تواند قبل از رهاسازی به دریا جهت شناخت شرایط آن­ ها برای اهداف حفاظتی مفید باشد. Alizadeh, H., 2004. Introduction to the Caspian Sea. Tehran, Norbakhsh Press. 113 p.
Avigliano, E.; Saez, M.B. ; Rico, R. and Volpedo, A.V., 2015. Use of otolith strontium: calcium and zinc: calcium ratios as an indicator of the habitat of Percophis brasiliensis Quoy & Gaimard, 1825 in the southwestern Atlantic Ocean. Neotropical Ichthyo. Vol. 13, pp: 187-194. Bakhshalizadeh, S.; Bani, A. and Abdolmalaki, S., 2013. Comparative morphology of the pectoral fin spine of the Persian sturgeon Acipenser persicus, the Russian sturgeon Acipenser gueldenstaedtii, and the Starry sturgeon Acipenser stellatus in Iranian waters of the Caspian Sea. Acta Zoologica. Vol. 94, No 4, pp: 471-477. Bakhshalizadeh, S.; Bani, A.; Abdolmalaki, S.; Nahrevar, R. and Rastin, R., 2011. Age, growth and mortality of the Persian Sturgeon, Acipenser persicus, in the Iranian waters of the Caspian Sea. Caspian Journal of Environmental Sciences. Vol. 9, No 2, pp: 159-167. Berejikian, B.A. ; Hard, J.J.; Tatara, C.P. ; Van Doornik, D.M. ; Swanson, P. and Larsen, D.A., 2016. Rearing strategies alter patterns of size-selective mortality and heritable size variation in steelhead trout. Canadian J of Fisheries and Aquatic Sciences. Vol. 999, pp: 1-11. Brennan, J.S. and Cailliet, G.M., 1989. Comparative age determination techniques for white sturgeon in California. Transactions of the American Fisheries Society. Vol. 118, No. 3, pp: 296-310. Campana, S.; Chouinard, G.; Hanson, J. and Fréchet, A., 1999. Mixing and migration of overwintering Atlantic cod (Gadus morhua) stocks near the mouth of the Gulf of St. Lawrence. Canadian Journal of Fisheries and Aquatic Sciences. Vol. 56, No. 10, pp: 1873-1881. Campana, S.; Chouinard, G.; Hanson, J.; Frechet, A. and Brattey, J., 2000. Otolith elemental fingerprints as biological tracers of fish stocks. Fisheries Resea. Vol. 46, pp: 343-357. Campana, S.E., 1984. Microstructural growth patterns in the otoliths of larval and juvenile starry flounder, Platichthys stellatus. Canadian J of Zoology. Vol. 62, pp: 1507-1512. Campana, S.E., 1999. Chemistry and composition of fish otoliths: pathways, mechanisms and applications. Marine Ecology Progress Series. Vol. 188, pp: 263-297. Campana, S.E. ; Fowler, A.J. and Jones, C.M., 1994. Otolith elemental fingerprinting for stock identification of Atlantic cod (Gadus morhua) using laser ablation ICPMS. Canadian Journal of Fisheries and Aquatic Sciences. Vol. 51, No. 9, pp: 1942-1950. Campana, S.E. and Jones, C.M., 1993. Analysis of otolith microstructure data. Canadian Special Publication of Fisheries and Aquatic Sciences. 73 p.
Claiborne, A.M.; Miller, J.A. ; Weitkamp, L.A.; Teel, D.J. and Emmett, R.L., 2014. Evidence for selective mortality in marine environments: the role of fish migration size, timing, and production type. Marine Ecology Progress Series. Vol. 515, pp: 187-202. Debicella, J., 2005. Accuracy and precision of fin-ray aging for gag grouper (Mycteroperca microlepis). Master’s thesis, University of Florida, Gainesville, FL p.
Folkvord, A. and Otterå, H., 1993. Effects of initial size distribution, day length, and feeding frequency on growth, survival, and cannibalism in juvenile Atlantic cod (Gadus morhua L.). Aquaculture. Vol. 114, No. 3, pp: 243-260. Kerr, L.A. and Campana, S.E., 2013. Chemical composition of fish hard parts as a natural marker of fish stocks. Stock Identification Methods: Applications in Fishery Science. pp: 205-234. Koch, J.; Schreck, W. and Quist, M., 2008. Standardised removal and sectioning locations for shovelnose sturgeon fin rays. Fisheries Management and Ecol. Vol. 15, pp: 139-145. Moghim, M.; Kor, D.; Tavakolieshkalak, M. and Khoshghalb, M., 2006. Stock status of Persian Sturgeon (Acipenser persicus Borodin, 1897) along the Iranian coast of the Caspian Sea. Journal of Applied Ichthyology. Vol. 22, pp: 99-107. Pannella, G., 1971. Fish otoliths: daily growth layers and periodical patterns. Science. Vol. 173, pp: 1124-1127. Pauly, D.; Alder, J.; Bennett, E.; Christensen, V.; Tyedmers, P. and Watson, R., 2003. The future for fisheries. Science. Vol. 302, pp: 1359-1361. Price, S.A.; Friedman, S.T. and Wainwright, P.C., 2015. How predation shaped fish: the impact of fin spines on body form evolution across teleosts. In Proceedings of Royal Society B. Vol. 282, pp: 1428. Pourkazemi, M., 2006. Caspian Sea sturgeon conservation and fisheries: past present and future. Journal of Applied Ichthyology. Vol. 22, pp: 12-16. Ricker, W.E., 1973. Linear regressions in fishery research. Journal of the Fisheries Research Board of Canada. Vol. 30, pp: 409-434. Ricker, W.E., 1975. Computation and Interpretation of Biological Statistics of Fish Population. Bulletin Fisheries Research Board of Canada. Vol. 191, pp: 382. Rosenberg, A. and Haugen, A., 1982. Individual growth and size-selective mortality of larval turbot (Scophthalmus maximus) reared in enclosures. Marine Biology. Vol 72, No. 1, pp: 73-77. Saborowski, R. and Buchholz, F., 1996. Annual changes in the nutritive state of North Sea. Journal of Fish Biology. Vol. 49, pp: 173-194. Schismenou, E.; Giannoulaki, M.; Tsiaras, K.; Lefkaditou, E.; Triantafyllou, G. and Somarakis, S., 2014. Disentangling the effects of inherent otolith growth and model-simulated ecosystem parameters on the daily growth rate of young anchovies. Marine Ecology Progress Series. Vol. 515, pp: 227-237. Sponaugle, S., 2009. Daily otolith increments in the early stages of tropical fish. Tropical Fish Otoliths: Information for Assessment, Management and Ecol. Springer. pp: 93-132. SPSS. 1997. SPSS Base 7.5 for Windows. SPSS, Chicago, IL. Van Poorten, B.T. and Walters, C.J., 2016. How can bioenergetics help us predict changes in fish growth patterns? Fisheries Research. Vol. 180, pp: 23-30. Wells, B.K. ; Rieman, B.E. ; Clayton, J.L. ; Horan, D.L. and Jones, C.M., 2003. Relationships between water, otolith, and scale chemistries of westslope cutthroat trout from the Coeur d'Alene River, Idaho: the potential application of hard-part chemistry to describe movements in freshwater. Transactions of the American Fisheries Society. Vol. 132, pp: 409-424. Wootton, R., 1999. Ecology of teleost fishes. Croom Helm, London.